If I could go anywhere tonight, it would be to a quiet little street in Jerusalem. I get there late, ten or eleven, possibly later. It’s usually after a long bus ride from Beer-sheva and a visit with my parents. Sometimes, I take a cab, and ask the driver to stop at the little makolet just a few streets from her home, so I can pick up a pint or two of ice-cream. Inevitably, I get lost in the winding streets between the store and her home, even though it’s supposed to be pretty straightforward. Other times, I go straight to her house. It’s dark as I make my way up the three flights of stairs- I’m running so late that I don’t bother looking for the light, as if those extra five seconds would make a difference. I knock softly; her kids are sleeping. She always takes a rather long time coming to the door and it always makes me pause- I really shouldn’t be coming here so late. She opens the door, slightly at first, nudging it barely ajar, as if I hadn’t already messaged her on the way, as if it could really be someone else. Her face is tired, but her smile is so warm that I forget hesitating at her doorstep, and how long it took me to get here, and how hectic my day was, and I leave it all at the door. Her house is warm and quiet and I feel welcome. We sit on the couch, curled up beneath a blanket. We’ll sip champagne or whiskey, and eat coffee ice-cream. If I get there in time for dinner, we might order sushi or her husband might make us his famous shnitzelonim. Usually though, he’s out. When he comes home, he’ll drive me home, or sometimes she does, slipping a skirt over her pajamas, and a scarf on her head. We drive through empty streets, the world quiet, streetlights flashing orange, the city a garland of lights. We arrive and she parks the car. You would think that after all these years there would be nothing left unsaid, but our store of words is endless, and we linger until the sky lightens up at its edges. Yaki was in Miami this weekend- sunshine, beaches, palms. I’m cuddled up indoors with a scarf and a sweater, on my third cup of coffee. Our house feels large, expansive, quiet. I wander through the rooms, feeling a little lonely. 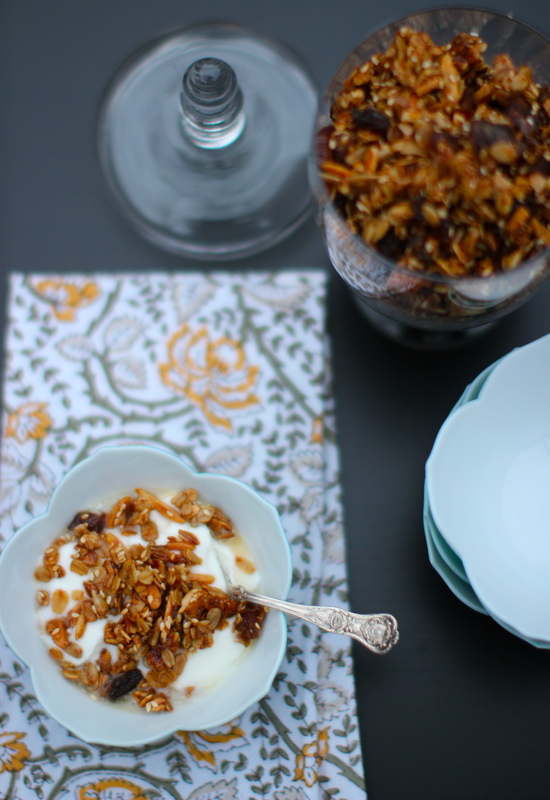 And now for the granola, because that’s why we’re really gathered here today, right? Or is the granola an excuse for me to reminisce about evenings in Jerusalem? 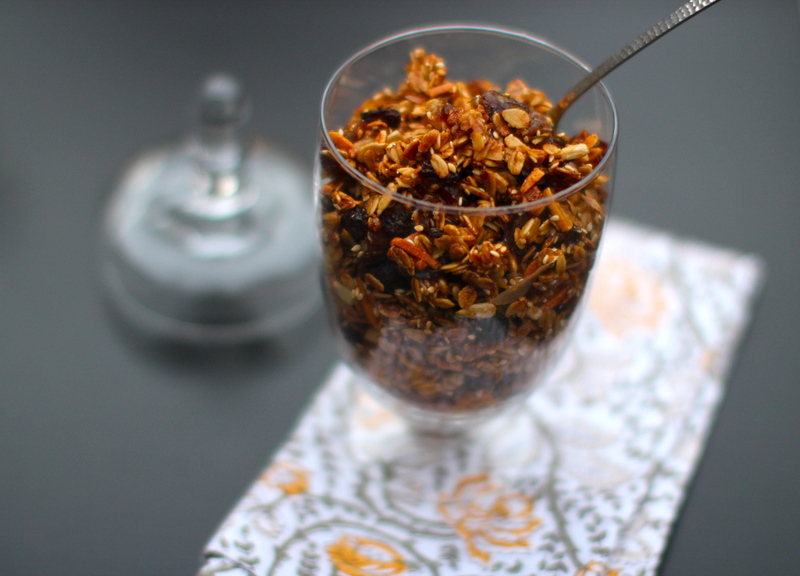 Either way, this granola is perfect: it’s crisp and gorgeous and layered with flavor. It’s the easiest thing to make- just measure out all of the ingredients into a large bowl, give it a good stir, then spread it out on a large pan and shove it in the oven. Bonus: it will make your house smell golden. This makes a nice amount (the original recipe says 9 cups), so if you have any holiday gifts left to make, I’m willing to bet this would be well received (you know, unlike those argyle socks). 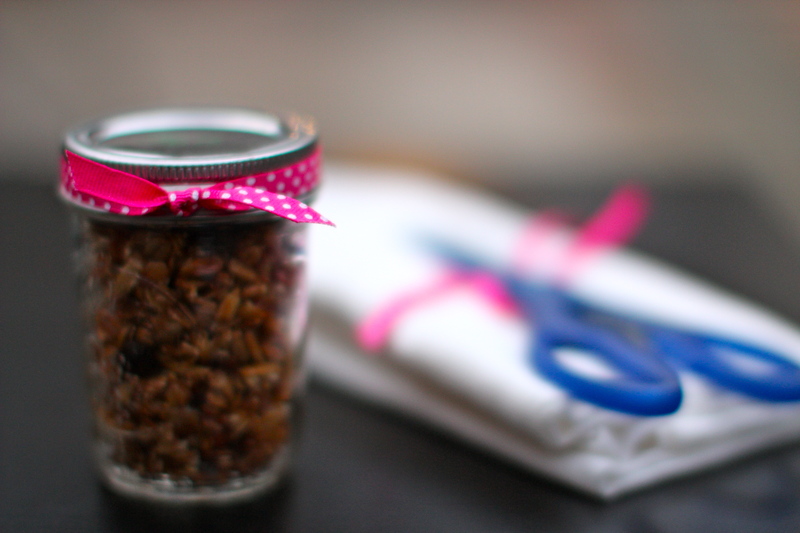 Also, Olive Oil Granola- pretty perfect for Chanukah. 1. Preheat oven to 300F/150C. In a large bowl mix together all of the ingredients listed under “Step 1”. Spread mixture onto a rimmed baking sheet in an even layer and bake for 45 minutes, stirring every 10 minutes, until golden brown and well toasted. 2. 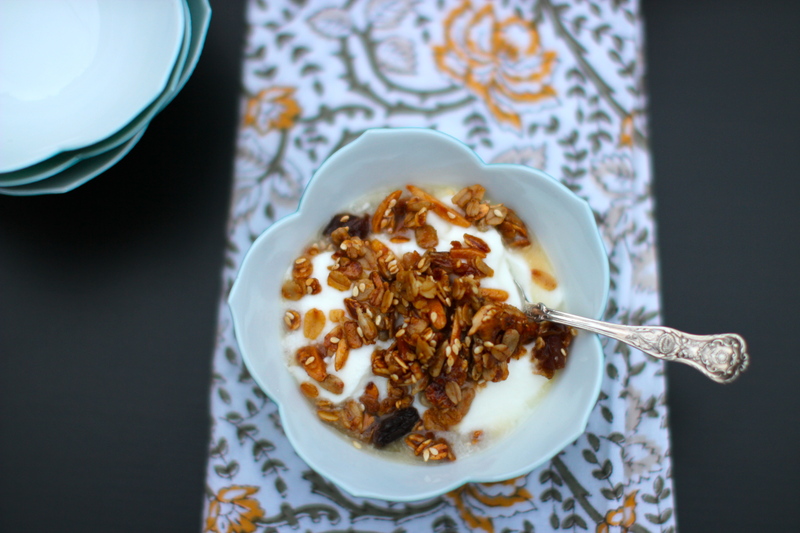 Transfer granola to a large bowl and add dates and raisins, tossing to combine. Run your fingers through the bowl to dissolve any clumps. Let cool, and transfer to an airtight container. Enjoy with yogurt. with those beautiful pics, i feel like making it right now. Babe!! It looks amazing!! But their seems to be a problem with the first photo? Thanks sweetie! I’m pretty sure it’s gluten-free, right? Ask your in-house chef to make it for you! What do you mean about the first photo? I always think that I don’t like oatmeal – then I see a dish like this and it turns it all around! I hope you try it, Yosef! 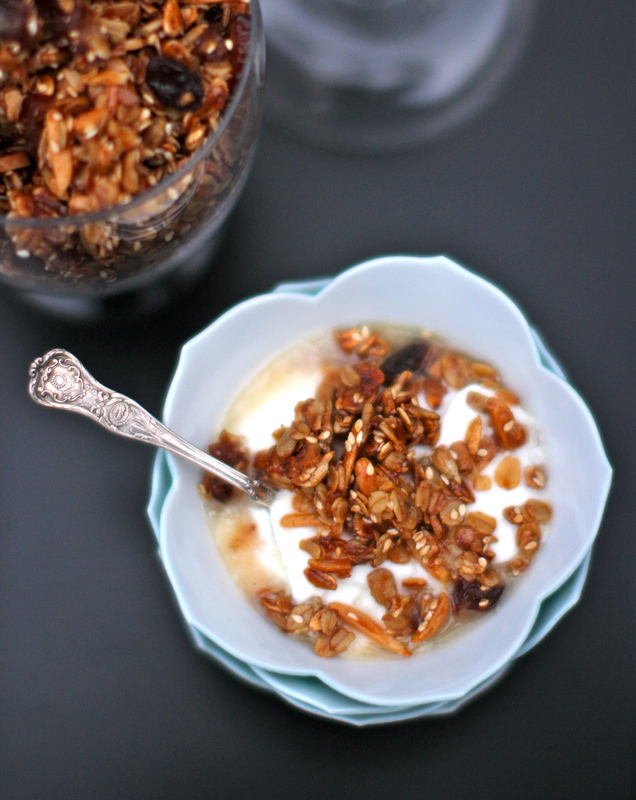 Granola definitely doesn’t taste like oatmeal- it’s crisp and golden and pretty addictive! (I’ll note for the record though that I do like oatmeal too). Looks absolutely delicious and cannot wait to try it!! Great blog, with interesting ideas, recipes and beautiful pictures. I am happy that I found you!! Good luck and please can you share a recipe for a gluten free chocolate cake? There’s only 1 tablespoon of flour, and you can easily substitute it for cocoa powder (I’ve done it!). I hope you try the granola- it’s really amazing!